Young or old, there is nothing quite like the sound that you get from vinyl. 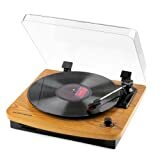 Whether you are listening to an old Beatle’s record or the latest limited edition vinyl from your favorite band, a good turntable for home use is a must-have for music fans all over the globe. If you’re new to turntables, then you are in for a real treat. Prices for these things vary, with lots of good cheap turntables on the market. And they have lots of great features. To help you add one of these to your home sound setup, check out our tips and reviews below. 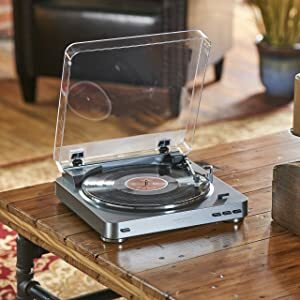 Because, simply, a good-quality turntable used with vinyl records in good condition will sound better indefinitely than digital music, every time. Vinyl sounds warmer, like the musicians are playing live in your living room. Also, once you have a turntable, you have an excuse to go to all the record hobby shops you’ve seen. You can buy music by your favorite artists for sometimes $7 an album if you hunt long enough, and the condition might be pretty good … and that’s easily half what you’d pay for the digital album. Record collecting is a great hobby for art enthusiasts, too, because the album covers and leaflets are actually big enough to see and appreciate. The base of a turntable is called the plinth. Being the support for the entire machine, the plinth usually has feet for better stability, and therefore, a more accurate and steady read of the album. The plinth can be made of wood, plastic, metal, or other materials. The rotating plate on which the record spins is called the platter. Powered by the turntable’s motor, the platter works best when it’s heavy, because that prevents vibration and makes for better playback. Platters usually have mats, of felt or such, on top for the vinyl to rest on while it plays. The mat provides a cushion, grip, and dampens vibration. The platter’s rotation speed on older turntables must be adjusted for the cut of the record to be played. 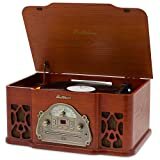 Most modern turntables can play both 33 RPM and 45 RPM albums, but for very old 78 RPM format records, a modification kit must be purchased, if not an entirely new turntable. The tonearm is the mechanical arm with the needle that swings out over the record to play in its grooves. A tonearm that is well-designed does more than carry the needle: it keeps a consistent sound and speed from the outside of the record to the inside. Poorly designed arms can slow on outer tracks, and speed up on inner tracks. The part that holds the tonearm is called the cueing device. It’s fairly sophisticated in terms of mechanics, but it only has one important job: to make initial contact between needle and album without lateral movement that could scratch the vinyl. The cueing process can be either automatic or manual – meaning, you either push a button and the arm swings out and the needle drops all by itself, or you place the arm over the record and push a lever to tell the cueing device to set the needle down. As for the needle itself, that’s called the stylus, and the housing for the needle is the cartridge. Styluses need to be replaced over time, as degradation (even if you can’t see any) will cause sound quality to deteriorate. As with any purchase of electronics, some important factors to consider before buying a turntable are price range and features. You also need to decide at the start if you really want high quality sound, or if you just want to try out vinyl as a personal fad, and maybe do some DJing or scratching. 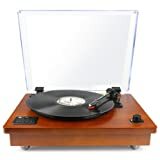 If you want to make vinyl sound as warm and beautiful as it famously can, you’ll want to look for Audiophile turntables. Sound quality varies an almost unbelievable amount between turntables … But once you consider how tiny the grooves are on a vinyl record – one groove is narrower than a human hair – you can see how important precision is for a turntable mechanism, and you might begin to understand how quality can vary so much. Higher cost correlates mostly just with precision, accuracy, and stability/steadiness of the needle arm mechanism, which is almost astounding. Maybe you are on a budget? If so, we suggest doing your comparison shopping by looking at the best rated turntables for the price in your budget range. 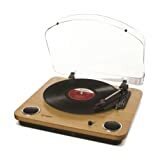 To help you out, you can use the links below to find the best economical turntable for your budget that is available at Amazon. Based on our extensive research of the top turnables on the market for the price, we have narrowed down our favorites to the 10 models that you see listed up above. To help you make a decision on which model is best for your music listening needs, we have taken a moment to do some mini reviews on each model. Below, you will learn a bit more about each one so you can determine which model best meets your home audio needs. The silver or black Audio-Technica AT-LP120-USB Direct-Drive Professional model is perfect for the DJ or other serious music lover. Included in the package is software for easy downloading of vinyl records into digital form. Both Mac and PC users can connect this awesome piece of audio gear to their computers via the USB port and included cable. The S-shaped tonearm has a counterweight for added stability. Unit plays 33-1/3, 45 and 78 rpm records. 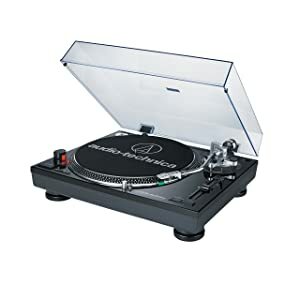 It is possible to use the Audio-Technica AT-LP120-USB Direct-Drive Professional model along with other standard DJ equipment. Just activate the start/stop button, either manually or remotely, to switch between accessories. 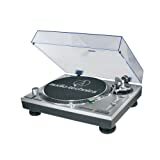 At 5.3 pounds, the Audio Technica AT-LP60 Fully Automatic Stereo Turntables System model is a fairly lightweight unit that is easy to transport. The tonearm has a damping control. Get increased sound quality from the built-in, filtered pre-amplifier. Select between the available 33 and 45 RPM speed options. Use the included 45 RPM adapter to make outsized records fit. Enjoy the attractive silver color scheme. Overall, the Audio Technica AT-LP60 model is good for both professional and personal use. A few believe that a three-speed system is better; nevertheless, this good two-speed turntable plays most vinyl records. 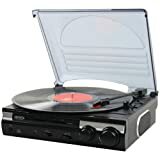 It is a good choice for the music fan who is on a budget and shopping for cheap home turntables. This Jensen JTA-222 3-Speed model is just what the DJ of today needs to play records at social functions, such as parties and weddings. In fact, anyone with vinyl records will benefit having this turntable around to spin a few tunes. There are three speeds, 33/45/78 RPM, from which to choose. The Am-FM stereo radio has lots of on-air channels. This unit has two internal speakers, plus outputs to attach external ones. Use the headphone jack when needed. The antique case design is beautiful, yet functional. Overall, this Jensen model is a solid product; however, some believe it lacks sufficient bass strength. Solving this problem is easy because all owners have to do is purchase some external speakers. 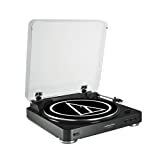 For vinyl lovers the Audio Technica AT-LP60BK is a return to the classic record player with style. Complete with the protective cover, the player provides 2 speeds (33 1/3 and 45 RPM), anti-vibration dampening in the frame and body assembly, easy output switch capability from speaker to headphones, and a user friendly stylus changeout system for the playing needle. The unit will blend in well with most tower home stereo systems, and is completely compatible with powered speaker networks. The immaculate design and modern technology that is provided by the Electrohome Winston Vinyl Record Player 3-in-1 Classic Turntable is, without a doubt, second to none. It holds features that even the most esteemed music lover will find to be outstanding, such as built in speakers, diamond tipped ceramic needle, and it plays speeds of 33 1/3, 45 and 78 RPM so that vinyl records from all generations and decades can be cherished and loved. Its exterior is a beautiful piece of work to have on display in your home. Capturing the nostalgia of the original turntables, this beautiful masterpiece is something that music lovers will cherish with their friends and family for many years to come. The TechPlayTurntable turns up any party with its retro-modern design and new age features. 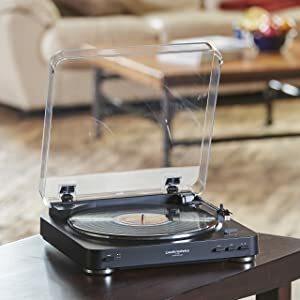 With so many different options, including pitch control to adjust record speed, lift lever, speaker system, three speed turntable system, USB ports for recording, and an AUX connection for your smart phone this turntable has everything a music lover could want-and then some. Its LED lighting makes it a beauty to look at as well. Being able to listen to old records on this modern device is enjoyable for everyone, and it provides endless fun for those wanting to record the sounds that come from this great machine. If you are looking for your next music technology purchase, the TechPlayTurntable provides music lovers with a great mix of technology and design to make sure you are entertained for years to come. 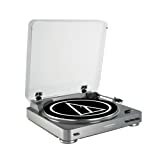 The Audio Technica AT-LP120BK-USB Direct-Drive Professional model comes in either black or silver. There is an internal stereo preamplifier for added sound quality. Connect this system to either a Mac or Windows PC via the USB port. For added convenience, a USB cable comes included. Professional DJs, and others, have three speeds, 33-⅓, 45 and 78 RPM, from which to choose. Tonearm has an anti-skate adjustment feature to keep things steady. There is also an adjustable counterweight. Being able to digitize old vinyl records is an added benefit of this Audio Technica piece of audio gear. Users can connect to their computers to transfer records for permanent storing. 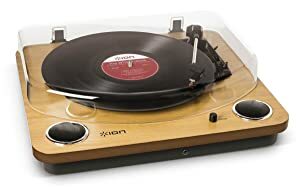 The Ion Audio Max product line makes this product entirely affordable for vinyl music lovers. 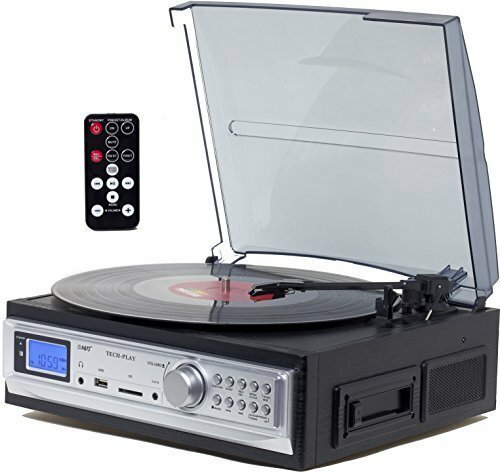 The Audio Max model provides a record lover with a consolidated turntable system that adds the capability of USB function as well. 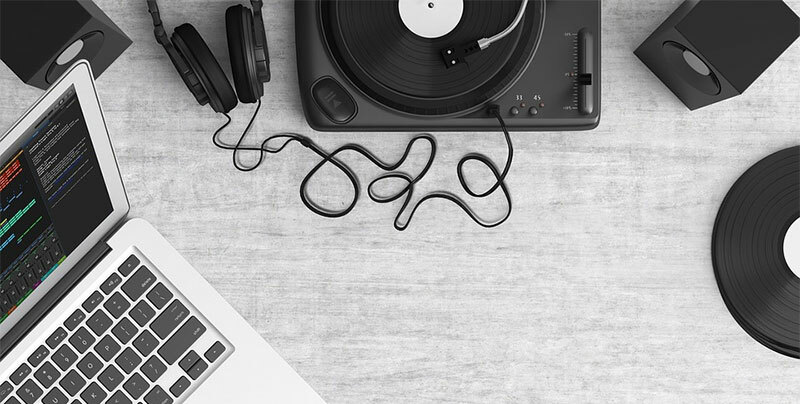 Not only can users enjoy their vinyl in record format, they can now convert the music to digital format as well. All major vinyl record types work with the model (33 1/3, 45 and 78RPM). And when you’re rocking out too loud for a roommate or family, headphones can be easily jacked in for private listening. Go back in time to the sounds of old school vinyl, and do it in style, with the Audio Max! Maintaining an essence of vintage charm and combining it with state of the art, new age technology the 1byone Belt Driven Bluetooth Turntable is the ideal turntable for music lovers everywhere. Featuring visual design such as a wood base and complimentary dust cover, it goes above and beyond with technology features like vinyl-to-MP3 recording, a built in stereo speakers, and 33/45/78RPM speeds settings. Its Bluetooth capabilities enable music to be streamed to the turntable easily, providing hours of entertainment and beautiful music for all to hear. For the music lover who holds style as an important factor in their technology, the 1byone Belt Driven Bluetooth Turntable is a great purchase. 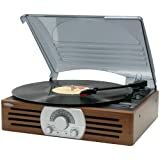 Its eclectic mix of vintage charm and modern technology makes it a great choice for even the pickiest of music junkies. For music lovers who are looking for a great new toy, this TechPlay ODC19 BK 3-Speed model is a purchase that doesn’t disappoint. 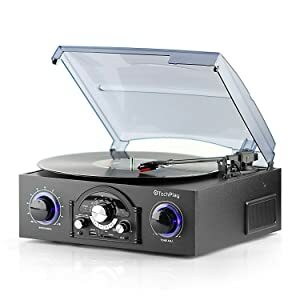 With outstanding features such as MP3 compatibility, USB connection, one key cassette player, 3-speed stereo, built in speakers, and vinyl to MP3 conversion this little device effectively joins the old vintage turntable with modern day technology and style. 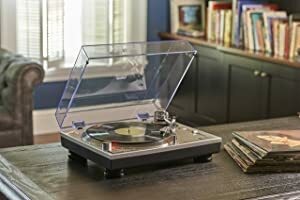 This is a great way to be able to get your old vinyl albums copied into a format your computer can read so you can continue to enjoy your old records wherever you may be. The included remote control really adds some extra convenience, making the TechPlay ODC19 BK 3-Speed Turntable an ideal purchase for music lovers from all generations. There are certain things one should never do with a turntable. Besides forcing the platter to stop when it’s spinning, which will scratch the platter (and the record, so wait for it to stop spinning before you try to take it off!!!) most of it is common sense – as in, don’t eat or drink over the turntable. Also, don’t let dust and dirt build up, either on the platter, or on the tip of the stylus. To help you get your home listening experience all set up and optimized, take a moment to watch the instructional video below. It gives you tips on the proper way to set up turntables at home for your music. It s a bit more expensive than the previously listed models but if you have the cash, you re getting one of the best DJ turntables in terms of build, longevity and overall features.